Who Inherits Your Investment Portfolio With No Will? Who Inherits Your Investment Portfolio If You Leave No Will? Although you probably know it's important to have your will finished, notarized, and on file with your estate attorney, not everyone has their financial affairs in order despite having the intention to do so. This begs the unfortunate question, "Who inherits your investment portfolio if you leave no will?" Where do your stocks, bonds, mutual funds, retirement accounts such as a Roth IRA or 401(k), annuities, real estate properties, and other securities go once you've fallen off the mortal coil? Glad you asked! Let's dive into a general overview so you walk away with a better understanding of the process. The short answer: It depends. Before we get into the specifics, we need to talk about something called "intestate succession". If the person who passed away (the "decedent") has no children, the spouse inherits 100% of the estate. If the decedent has children, the spouse inherits the first $20,000 of the estate and then 50% of the estate balance with the children splitting the remaining 50% among themselves. 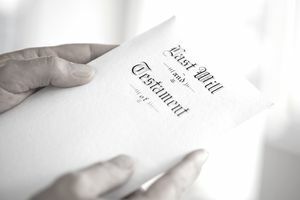 If the spouse is also dead or the decedent was never married, the children (or if they have died, their children) inherit the entire estate in equal parts. If there is no spouse or children, the decedent's estate is divided equally among his or her father, mother, brothers and sisters, or their descendants in equal parts. If there is no spouse or children, siblings or parents, the decedent's estate is divided equally among his or her grandfathers, grandmothers, uncles and aunts, or their descendants in part. It goes on and on to the point that you could be dealing with remote scenarios that might better fit in a Downtown Abby script with assets inherited by long-lost second cousins twice removed but beyond a point, the property left behind without a will is "escheated" to the state. This means that the whole thing effectively goes back to society in the form of seizure by the state, which will use it in its general budget to pay for things like roads and education. Unfortunately, the intestate succession laws can sometimes lead to horrifically unfair outcomes for those who, given the specific circumstances in your life, you would have wanted to inherit your investment and property (which is one of the reasons you should always have a will). be sure to research the specific laws in your state. One way you can get around a lack of will or the laws of intestate succession is to title property in ways that supersede all other considerations. Let's imagine that you hold $500,000 worth of blue chip stocks in a taxable brokerage account that you title as either "joint tenants in the entirety" (if you are married and your state permits spouses to do this). Or, perhaps, you title it as joint with right of survivorship, putting your favorite nephew on the account. Even still, maybe you use a "payable on death" designation for your sister, who supported you through thick and thin. When you die, it doesn't even matter if you did have a will stating something different than the title because the will itself would even get ignored as pertains to those specific assets! This can be fantastic for a quick-and-easy do-it-yourself inheritance setup. In fact, you can even use it to your advantage because payable on death designations allow you to effectively increase your FDIC insurance limits into the millions of dollars if you do it correctly. The downside of all of this is that people can sometimes forget to update their paperwork or fail to do periodic reviews of their account records to make sure nothing has changed. It sounds like a minor thing but lives have been financially destroyed over it. For example, let's say you set up your 401(k) decades ago when you were married to your first spouse with whom you had no children, and have subsequently divorced and remarried. You never bothered to update the beneficiary form on your retirement plan, so when you die, the ex-spouse gets everything even if you hadn't seen or heard from him or her in years. You've succeeded in de facto disinheriting your own family with the fruits of your career going to someone who is no longer part of your life. The same is true for beneficiaries on other financial products and contracts such as life insurance and annuities. Whether or not you die without a will, the beneficiaries listed on the account, including retirement accounts, take precedence over everyone else. Generally, there will be two classes of beneficiaries: primary beneficiaries and contingent beneficiaries. Typically, the primary beneficiaries inherit as a class and only if all of them are dead at the time you pass away will the contingent beneficiaries be entitled to a cut of the fiscal pie. An illustration might help. Imagine we are many, many years in the future and you are a widow or widower. You have a $1 million in a Roth IRA that you build up over the decades. You have the account held in custody at Charles Schwab, Merrill Lynch, Northern Trust, or some other qualified firm. You list your three children as your primary beneficiaries. You list your five grandchildren as your contingent beneficiaries. Further imagine that, when you pass away, one of your children is already dead, having passed away a few years earlier. This means there are two remaining primary beneficiaries. They would now each inherit 1/2 of the IRA rather than 1/3rd and the contingent beneficiaries (the grandchildren) wouldn't get anything since there are still primary beneficiaries ahead of them in the payout line. Alternatively, you can title your property in the name of a revocable living trust, which, when designed correctly, by-passes probate as well. Assets held this way, even if you die without a will, are handled by the trustee, such as a bank trust department, as provided in the trust instrument.